I was one of the fortunate people who chose to go on a cycling fact-finding trip to the Utrecht area of the Netherlands organised by irishcycle.com in September. The trip was thought-provoking, enjoyable and inspiring (in showing what can be achieved) and a little depressing (in showing how far we have to go). Below are my personal observations. In the Netherlands, you quickly realize that it’s not all about cycling. It’s about creating a living environment that works well for it’s citizens. For instance, a constant message from Dutch officials was – If it doesn’t work for children, we haven’t yet succeed; we’ll have to refine it. Yes, they love their cycling but they also love their cars, their public transport and their environment. And they are pragmatic (and consumerist) enough to realize that commerce must be catered for; great infrastructure requires the funding from thriving business. So they constantly strive to get the balance right. Do they succeed? Yes, they do. But not necessarily on the first attempt. A constant refrain is – “Yes, we have that problem too. We didn’t know how to solve it so we’ve been trying several approaches. Somethings haven’t worked and we had to refine them. We experiment. We improve things by trying them. And we’re doing it gradually.” This willingness and ability to experiment, to evolve new solutions that get the balance right is, I think, why they’re at the forefront of cycling – and urban planning – development. 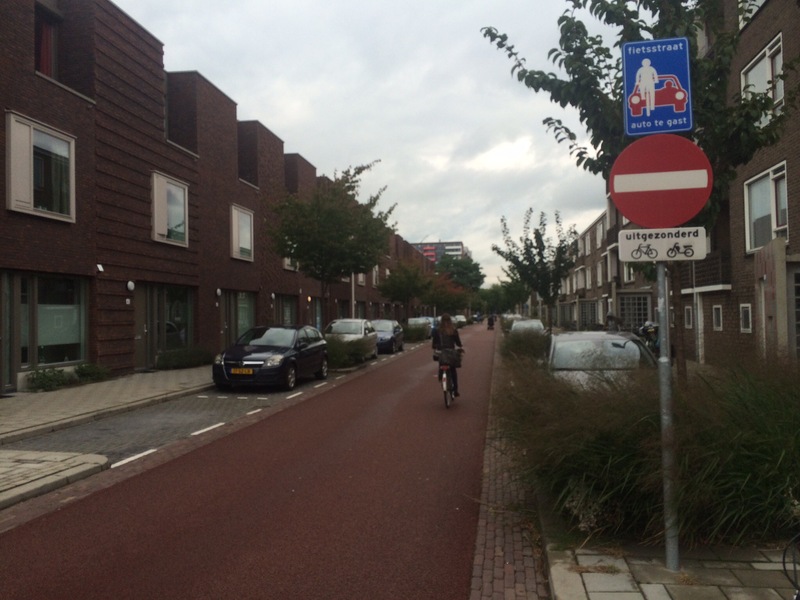 Bicycle streets in the Netherlands, where “cars are guest”, are not backed by law, just an experiment. Example from Utrecht. Main image: A child cycles with his mother in Houten. One-size-fits-all is rarely a full solution. There has to be adaptability to particular circumstances. They tend to use guidelines rather than overly prescriptive regulations. For instance, they use segregated cycle paths in some instances and well designed shared thoroughfares in others. In the latter, it is usually made clear to motorists that they are “guests” in an area where cyclists have priority by using surface colouring, speed ramps and signage. Officials acknowledged that they don’t have the power to impose solutions. Extensive negotiations with stakeholders is always required and, ultimately, political will is essential. It is often useful that politicians are, themselves, urban cyclists (not simply sports cyclists). For retailers, cyclists are customers – a bicycle is a two wheeled shopping trolley. Cyclists may spend less per visit but shop more frequently than motorists. They also support local businesses. Dutch people (unlike some of their neighbors, it was inferred!) will not obey regulations that don’t make sense to them. Officials try not to enact unenforceable regulations. If regulations are constantly flouted, they tend to investigate rather than seek to enforce. The answer often lies in better design – often entailing little cost. Investing in really good bicycle parking is worthwhile. Utrecht are currently building the biggest bike-park in the world for 12,500 bikes. Very nice series of articles. Yes, I wonder which neighbours that could be! We need one or more of the following to evoke real change! I think they also need to rewrite the rules of the Road to put a greater emphasis on Cycling. To show what contre flow is about and respect Cycle Lanes not to park on them. Every so often on each page to put Expect to see Bikes also to Expect to see Bikes on country roads and respect other road users. They should put Drivers on Bikes at Rush hour on City Roads to show them what it is like to be passed by Buses and Taxis within 4 cm of them before they renew their Licences. I think there should be a promotion on safety for children Cycling on the road, to slow down their cars. Motorist do not seem to get it and continue to speed. Yet another great….and different!… summary from the study trip to Netherlands. I am sure we shall see a few more yet, and it might be worth pulling them all together in some form of booklet or online publication!? Being an Dutch expat that commutes per (fast) ebike I tend to agree however my perspective is not shared by other road users. Sadly enough it are often the cyclists that by following the rules strictly move themselves unknowingly in dangerous situations. But we are on the right road and progress is made.